There’s another “green building” in Nulu. Situated behind Gill Holland’s showcase East Market Street Green Building is a small brick and limestone commercial structure on Jefferson Street. The three story building may be noticeably smaller than its counterpart, but the community spirit inside is just as strong. Once threatened with demolition, the newly dubbed Little Green Building is now fully occupied. Shine, a multifaceted company who has been restoring buildings and teaching yoga, has officially opened its headquarters in the renovated structure. I recently had a chance to sit down with Gregg and Maria Rochman, partners in the Shine venture, to find out how they came to choose Nulu for the headquarters. Gregg and Maria had been living in New York but were searching for a “kinder, gentler place to raise a family.” The couple began a nationwide search for a better location and, despite initial reservations about settling in Kentucky, fell in love with Louisville. The Rochmans had operated a mobile “movement and music” studio in New York and hoped to find a home base here in Louisville to set up a permanent shop. Many factors influenced their move including school quality and small business potential. Gregg and Maria chose to live in the “cool city” instead of Oldham County to take advantage of the activity and walkability of urban life. 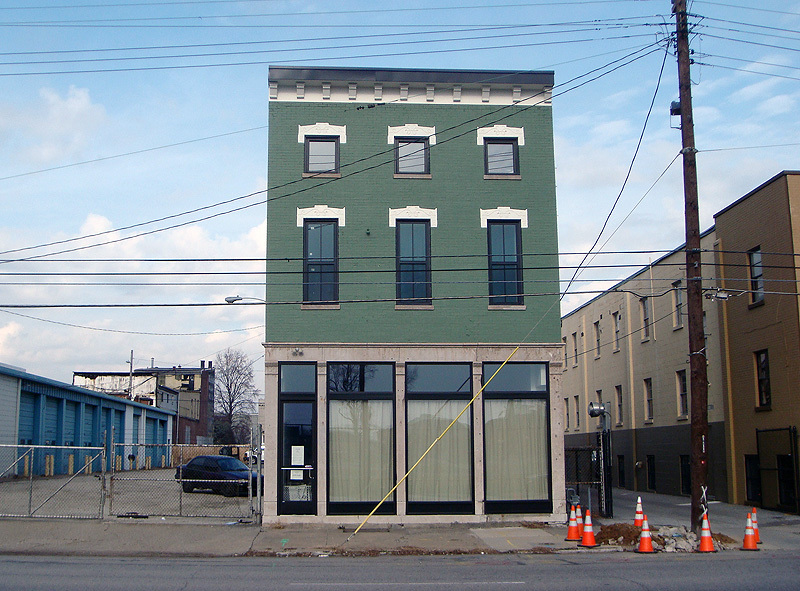 Operations began in the Mellwood Center and in December 2009 Shine moved into the just-finished Little Green Building. The small vernacular commercial building was saved from demolition several years ago by Gill Holland and Augusta Brown Holland and their team of backers and has now been restored by Shine. A couple years ago when the Disney Tire Company structure was for sale, the previous owners considered tearing down the historic structure for added parking in an attempt to make the property more attractive to a potential buyer. Holland and his team knew that this ploy for parking would really decrease the property’s and the neighborhood’s value and stepped in to purchase the property – both the Little Green Building and the Disney Building. Holland and partners plan to convert the Disney Tire half of the property into the Jefferson Market, a year-round, indoor-outdoor public farmers’ market. The Rochmans knew their vision meshed well with the Hollands’ and wanted to be a part of the expanding Nulu neighborhood. After the extensive initial renovation was completed by Tim Peter’s Construction (a partner with the Hollands in the venture), Shine Contracting stepped in to finish the interior fit-up on the structure. The structure was taken down to its bare shell and built back up and an entirely new roof structure was installed. Shine chose to use sustainable materials for the renovation project including cork floors and recycled woods. Recently, Shine acquired a new eco-foam insulation company and plans to incorporate the ultra-insulating material into its new renovation projects. 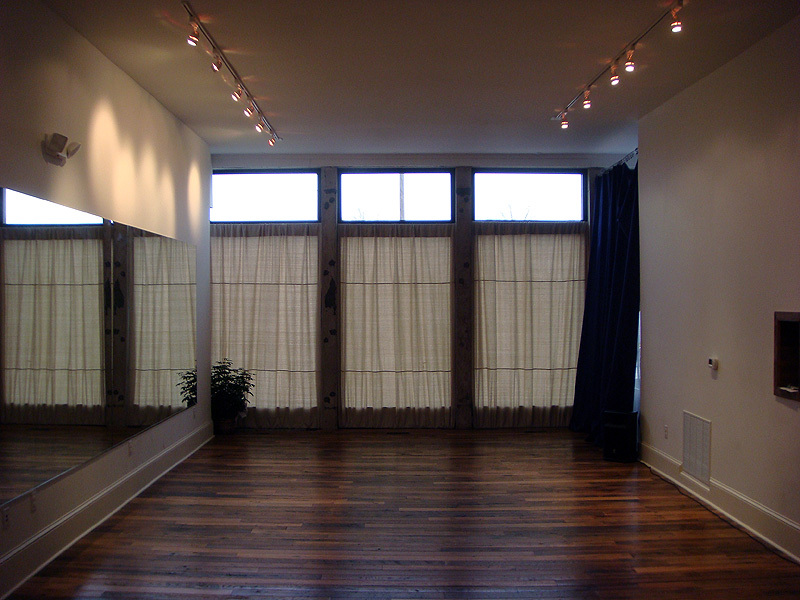 Gregg is particularly proud of the hardwood floors used in the movement studio. Boards were salvaged from an old barn in Lexington dating to the late 19th century and home to no less than seven Kentucky Derby winners including Old Rosebud, Sir Barton, and Paul Jones. 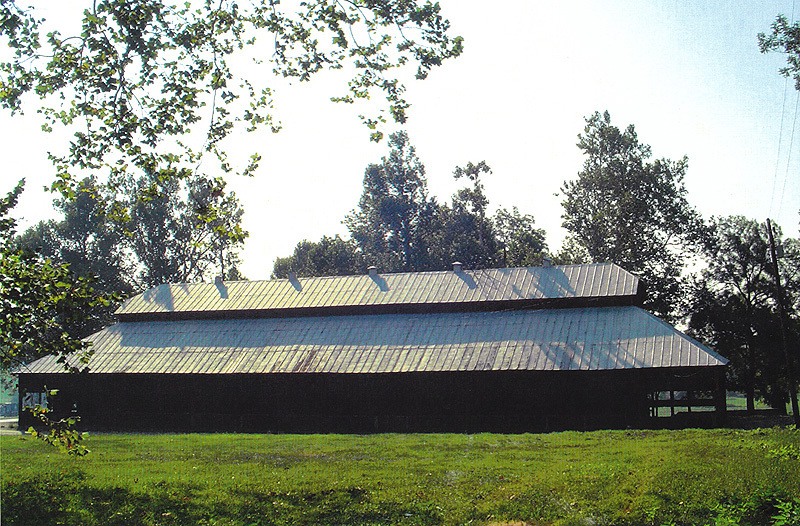 A Lexington-based company called Longwood specializes in saving wood from demolished barn structures for reuse in construction projects. As you might expect, the floors have a rich, golden patina. At this point it may be useful to point out that there are actually four Shine companies all operating in the Little Green Building – each specializing on improving different aspects of the community. 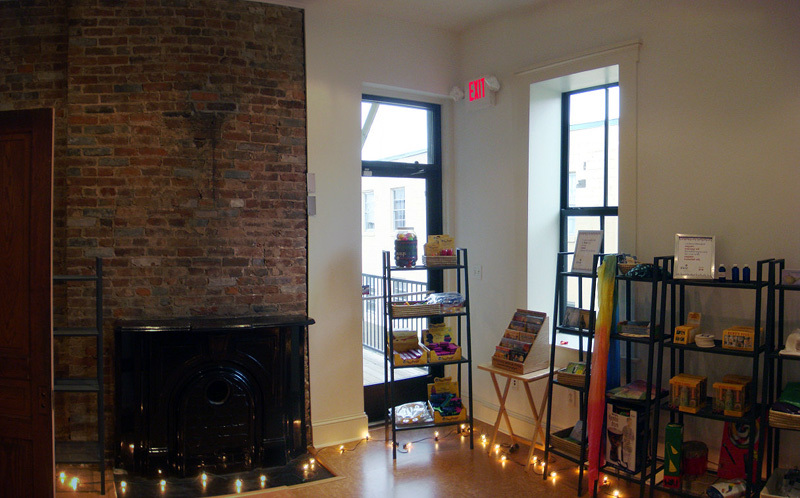 Shine Yoga, Movement, Massage & Family Music is the main tenant and operates on the first two floors with movement and yoga studios, a shop, and massage rooms. Shine Properties and Shine Contracting handle the real estate and construction sides of the business and operate out of the third floor. The fourth entity, Shine Property Management, is coming online as the company renovates more and more buildings across Louisville. While it may seem a little confusing, the goal of Shine is simple: to improve the entire community through mind and body and physical environment. The Rochman’s say Shine has made community improvement its first priority. Work is pretty much complete at the Little Green Building. Gregg and Maria say the final touch will be a new sign out front announcing the building and Shine, but there’s already a flurry of activity in and out of the structure. Classes in yoga, music, and more are already available and more information can be found on Shine’s web site.